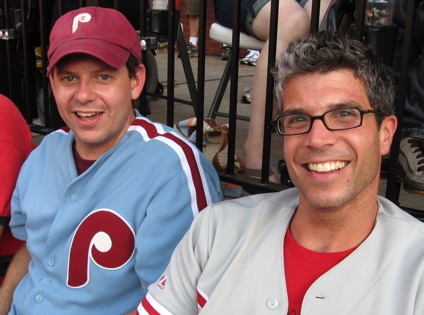 Meet Dave Zavitz (good looking one) and Greg Weyent (old one). That’s Dave’s description (duh!). These guys flew from Philadelphia for the game. That’s dedication. They were rewarded with a 2-1 win. Rock on, Phillie fans. I will, however, be rooting for the Dodgers when you’re in town this week. and say, “We got Manny!” Can’t wait to see his new ‘do. Will he or won’t he? Baseball is full of superstition, but must we invoke Samson and Delilah? Yes. That’s what makes baseball baseball. This entry was posted on 11 August, 2008 at 7:28 am and is filed under baseball. You can follow any responses to this entry through the RSS 2.0 feed. You can leave a response, or trackback from your own site. Oh and sorry I didn’t loan you the Utley jersey..next time?!?!? Pssst…picnic invites are coming out soon. That guy is awesome in his old school Phillies gear! These Phllly guys flew in just to watch them play the Cards?? Well, I guess we know where women rank with these Philly fanatics. But, I can’t blame them too much since St Louis is a truly great baseball town. Right field is my best position. I can’t really throw–but I can catch and run pretty good. I want to play baseball with Miss H.
Phillies fans are devoted..unlike certain fans of certain baseball teams who leave in the 7th inning, regardless if the team is winning or losing.